Merck developed a clever scheme for marketing HPV vaccine: it would lobby for laws that would add the vaccine to state Medicaid entitlements, require it be covered by private insurers and mandate the vaccine to attend school. I know of two different approaches at the state level. In 2007 in Texas, Governor Perry simply issued an executive order that all Texas schoolgirls entering sixth grade must receive the vaccine. This was the first state mandate for this vaccine. Merck had provided Perry financial support. The Texas Medical Association was against the mandate. After several months, the Texas legislature overturned Perry's order. Merck provided money to the organization "Women in Government", a national association of female state legislators. Women in Government, in conjunction with Merck, developed a massive campaign to encourage use of the vaccine and support state vaccine mandates. At first glance, it looked like a "win win" strategy for legislators: using state funds to prevent cervical cancer, in children. At least a dozen state legislatures considered instituting HPV mandates. But in the end, only Virginia and Washington D.C. passed HPV mandates for middle school girls. However, vaccinations have not been popular. "Opt out" provisions have been used by the majority of families. Only 17% of Virginia's eligible sixth graders had begun the 3 shot series, and only 23% of eligible sixth graders in the District had done likewise, at the start of this school year. On January 21, the Virginia House of Delegates passed a bill to eliminate the HPV requirement. It may not pass the Senate, and may not be enacted. Still, the bill gives notice that legislators are rethinking their hubris: citizens do not want decisons about their children's sexual health to be made by the state. Especially given the conflicts of interest. The Chief Medical Officer of Finland's National Public Health Institute has conceded that children and young people should possibly not have been vaccinated against swine flu. Dr Terhi Kilpi told the Väli-Suomi newspaper group's Sunday newspaper supplement that the vaccine perhaps should not have been given to 5-20 year-olds. Kilpi said that she would no longer recommend the vaccination for this age group. She added that if she had known of the potential consequences, she would have not inoculated 5-20 year-olds. "A year ago, the current understanding was that the swine flu was a danger specifically for the young. At that time there was not yet any reason to suspect serious side effects to the vaccine," said Kilpi. Finland's National Public Health Institute is to publish an interim report on the links between narcolepsy, the swine flu, and the vaccine this coming Tuesday. Autoimmune disorders encompass a large variety of illnesses, the fourth-largest general category of disease, it is said. A rare lymphoma, or neoplastic disease of the immune system, has been associated with breast implants. This article does not say the disease is autoimmune, and the mechanism by which the implant may lead to the disease is unspecified. But the likeliest causes imho are a) physical, i.e., the normal tissue was disrupted and this led to neoplasia; b) toxic (a result of the plastic material--silicone--intimately exposed 24/7 to human tissues) and c) autoimmune. These causes may be linked, or more than one may be involved in disease causality. Other autoimmune conditions have been identified with breast implants, but the nature of the beast is such that this has never been proven nor disproved. The worldwide market for breast implants is roughly $820 million a year and growing at 8 percent a year, according to industry figures. Breast implants may cause a small but significant increase in the risk of an extremely rare but treatable type of cancer, the Food and Drug Administration said on Wednesday. The risk applies to both saline- and silicone-filled implants, and to all women who have them, whether for reconstruction after cancer surgery or for cosmetic enlargement of the breasts. UPDATE: This is a 2006 article. Sorry. Too bad we have to get our science from the Mail, but in the era of Conflicts of Interest, maybe it isn't so strange that we read about the flip side of pharmaceuticals from media outlets that don't rely on pharmaceutical company advertising to survive. ... occasionally, vaccines cause injury or death. Very rarely, patients are left with what's known as "encephalopathy", the medical term for brain damage. In fact, CBS News has found nearly 1,300 cases in which vaccine-related brain damage has been compensated in court over the past 20 years. What made these children get sick? Why couldn't they tolerate their vaccines when most kids can? Unanswered questions. 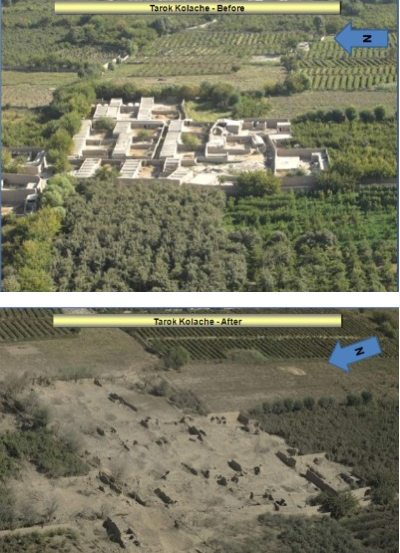 Shades of Vietnam: we had to destroy this village to save it. And the US plans to spend $1,000,000 to rebuild it. Of course no civilians, only Taliban, were killed. And we managed to save the pomegranite trees: good aim, guys! Read the WIRED story. Petraeus has waged a far more violent, intense fight than many expected. After earlier complaints that the failure to advertise flu jabs had led to low take-up rates this winter, the UK chief medical officer, Professor Sally Davies, said that vaccination rates were now at normal levels for the time of year. An earlier Telegraph piece had more facts. Government policy is to offer flu vaccine only to children at high risk due to an underlying condition. This makes good sense, in terms of balancing risk and benefit. Eighty per cent of the 70 children who died from flu complications last year had underlying health problems: for such children, the potential benefit of vaccination is much greater than for otherwise healthy children. Only 20% of UK child deaths from flu last year (14 children) were otherwise healthy. Healthy children, being at much lower risk of death or serious injury would have a reduced benefit from vaccination relative to chronically ill children, but equal potential risk from vaccination. According to the UK's Chief Medical Officer Sally Davies, "The data from the pandemic last year showed - and this year's data is very similar - that if you are in an at-risk group you are 18 times more likely to die of flu if you catch it than a healthy person, so we need to focus on getting those at risk to come forward and have vaccinations." Should healthy children be vaccinated nonetheless? The Cochrane Collaboration has found no evidence of benefit for flu vaccine in young children, based on metaanalysis of all published research, which Cochrane submits to a careful methodologic review. If it is a very bad flu season with many child deaths, it might make sense to vaccinate regardless. The Daily Mail reports 15 deaths in the 14 and under age group from flu in the UK this season. But during Australia's 2010 autumn, flu vaccinations for under-5's were stopped due to seizures in one child per 110 vaccinated, and several child deaths after vaccination. In other words, in very rare cases you may die from flu or from vaccine. The vaccine works, at best, 70% of the time, and some seasons it is entirely ineffective. It is also less effective in some groups compared to others. We don't know what the side effect profile of a flu vaccine will be until after millions have been vaccinated, since the vaccine is newly designed each year with selected viral antigens, Thus performing a reasonable risk-benefit calculation is difficult if not impossible. Improving early data collection of benefits and harms would help this situation, and is greatly needed. 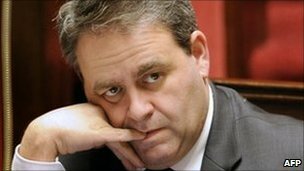 French Health Minister Xavier Bertrand has promised a complete revamp of the country's medical regulatory system.He was speaking after an official report said a diabetes drug which caused up to 2,000 deaths should have been banned 10 years earlier. The drug - known as Mediator - should have been banned as early as 1999, when it began to emerge that it could cause heart disease, the report said. Several other European countries and the US then withdrew it. But Mediator remained on sale in France for another 10 years. Between 500 and 2,000 people in France are believed to have died because of its side effects. It was developed to treat diabetics but millions of people took it simply to lose weight. The report by a government agency, the Social Affairs Inspectorate, said it was incomprehensible that the authorities had failed to act sooner. Mr Bertrand said it was now his duty to rebuild the regulatory system to protect the public. His statement is being seen as an admission that one of the biggest medical scandals in France in recent years may not be an isolated case. The affair has become politicised as the pharmaceutical company which manufactured the drug, Servier, reportedly had high-level political connections. The health minister himself has been implicated by French media reports alleging that two of his advisors had previously worked for the company. Wakefield Witch Hunt: What's Up? The BMJ, a medical journal that is more open to controversial subjects than most, just published an investigative piece and editorial claiming that Andrew Wakefield et al's research on children with developmental and gastrointestinal disorders and the MMR vaccine was "fraud." Wakefield's original research paper was retracted last year by the Lancet, following a decision by the General Medical Council (GMC) to pull Wakefield's license to practice medicine in the UK on the basis of his work on autism, 12 years after initial publication. I commented here. The paper had been, in its day, the exemplar of research on vaccine safety problems. As such, it drew heavy fire from its initial publication until retraction in February 2010. Lancet pulled the paper on the basis that the child subjects were not "consecutively referred," and that the research had not been approved by a local ethics committee. A large proportion of academic papers in top tier journals are tainted by gross forms of research misconduct, such as not having been written by their purported authors (an estimated 10% plus according to JAMA editors). Yet very few papers get retracted. The author of the BMJ piece is Brian Deer, a journalist who has been writing attack articles about Wakefield's work since 2004. Deer's interest appears to be uncovering scandals. He has pursued a variety of targets, but has especially focused on "uncovering" the truth about DPT/ pertussis and MMR vaccine injuries. Deer has challenged some parents and doctors of alleged vaccine-injured kids as liars. His piece in the BMJ claims that several of Wakefield's case series patients did not really have autism, or developed symptoms prior to receiving the MMR vaccine. Yet some of the parents he interviewed have challenged his statements. Brian Deer apparently interviewed parents using a false name and grossly false pretenses (promising to try and get them funds to help care for their children). See video by Alan Golding here. How did he even learn the patient names, which were confidential? For Deer to call Wakefield a fraud is an example of the pot calling the kettle black. Fraud is very serious, and should absolutely be uncovered and punished when it occurs. But I am not convinced that Brian Deer is a trustworthy source of such charges. And there is no other independent source to utilize at this point to sort out the truth of the matter. Another issue regarding Deer is massive conflict of interest. Deer was the complainant with the UK General Medical Council that led to the GMC spending millions of pounds to conduct its case against Wakefield. So Deer was essential to creating the story and keeping the pot boiling... then covering the story as if he was an uninvolved journalist: another example of acting under false pretenses. Martin Walker has written extensively on this subject. The BMJ article was immediately re-reported by media worldwide, presumably to discredit the vaccine-autism link. I found 720 articles on Google News this week that include the terms "Andrew Wakefield" and "fraud". It would be surprising if this outpouring of "news" occurred by chance. I think fraud is always going to be extremely hard to detect. In other cases, frauds have been detected sooner, so I think this is unusual in having survived in the glare of full publicity for so long without being detected. For me, Wakefield and Deer aside, the bottom line is whether receiving the MMR (or measles vaccine alone) may lead to neurological disease in susceptible children. I have spoken with many parents of autistic children (sometimes my own patients) over many years. I have heard the parents report chronic diarrhea and other bowel problems more often than not in affected children. A number of parents have told me how their child regressed into autism, after being neurologically normal, around 12-18 months of age: after receiving the MMR vaccine. Some of the parents had never considered a vaccine link when they told me their story. This clustering suggests that a causal relationship between measles vaccine and encephalopathy may exist as a rare complication of measles immunization. Here is the abstract and here is the full text. You cannot deny that the lives of some children and their parents have been destroyed after a measles vaccination. Their number keeps growing. It behooves us to find out why, and to find preventive measures for infectious diseases that will be safer for all children.